Great product....looks better than pic. Perfect for adding heavy-duty security to your home or just updating the style of a door, this front door handleset is available in both functional and dummy configurations. The simple, rustic design paired with the brass construction and nickel interior lever make the piece secure as well as beautiful. Sure-Loc Vail Front door Handleset was great quality. It had a variety of extra parts to fit a several different door possibilities. We had a locksmith install it because my husband didn't have the tools to remove old door hardware. Locksmith was happy to take extra parts because they sell this brand of handles, for about *** more than we paid through Overstock. Very happy with purchase. Beautiful - haven't installed yet but heavy duty and I am looking forward to using this on our 8' front door. I haven't installed this yet, but I just opened the box today and it is absolutely beautiful and heavy. It looks almost exactly like another handleset I was lusting after but was $1600. I can't wait to see this on my new front door! It is beautiful, unusual, fits the lodge style we are going for and is a very good value compared to what is available locally or at other online sites. To be aware of-there is a copper undercoat that shows around the edges. I'm not a fan of copper in my oil-rubbed bronze, but the other attributes make up for that little bit that shows. I purchased 7 handsets that included 3 different types of the Sure-Loc brand. Sets that were the same model came keyed the same. I took them all to a locksmith and he was able to just change the 3 that were different to the same key as the other 4, at less than $10.00 each. I had been worried that this lock would not take the same key, but it did. I would and probably will, buy again. We'll purchase inside handsets from the same company next. Solid as a rock, and pretty too! We thought it was expensive when we bought it, but now that we've seen it and used it we think we were undercharged! It is worth every penny and much more. This is the kind of front door handlesets that you see on the million dollar homes. Calling it sturdy is an understatement !!! I am a designer, I bought this for a 2 million dollar home. It is heavy and looks very rich and expensive. I love the finish and color. Awesome on entry door. Lot's of compliments. Heavy well made hardware with the look we want for our western house. 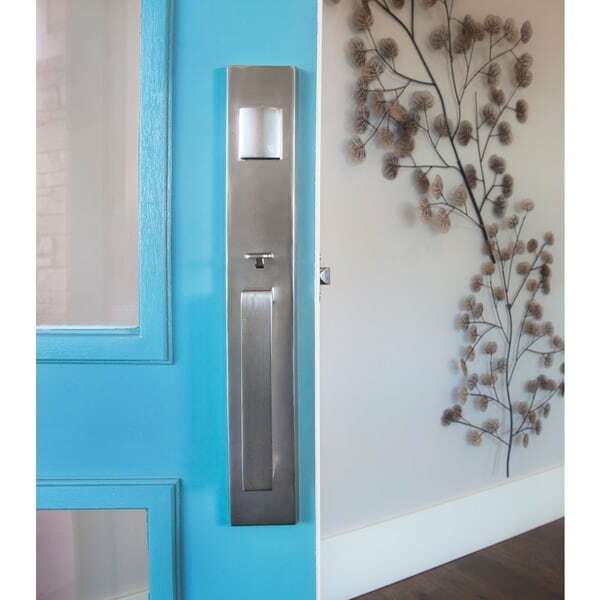 This hardware looks fabulous and was very easy to install. Only thing is the keys stick when turning but will probably loosen with use. Beautiful handles to look at and nice quality. We receive many compliments! This looks really beautiful. Exactly as expected! Great quality. "can this be used for right hand door? picture only shows left hand door." "Does the Sure-Loc Vail Front Door Handleset with Nickel Interior Lever, have a key entry? if so, where is the outside key hole? And does it include keys? All of the questions are contradicting each other." "Do you sell the matching dummy set?? I believe it is a VL500 in nickel"
"I'd like a door that locks with a key. The two answers below are contradicting each other. Is there a key? Thanks!" Hello mjw, yes, keys are included with the Sure-Loc Vail Front Door Handleset with Nickel Interior Lever. Have a great day. Hey! One option has a key the front entrance handleset and the dummy handleset does not! "This is an entry door lock, correct? If it does not come with a key, how am I supposed to use it as a working door lock?" I guess what I'm asking is - does it have to be keyed? Or does it come with a working key? Hello danylea, this does include a key, the key hole is concealed by the plate at the top that swings to the side to access the key hole. Thank you for shopping with us. "Is there a key lock on the Sure lock Vail handleset?" Hello cjoanm, this handleset does not feature a key lock. Thank you for shopping with us! Hey! This is determined by which option you pick. One is an active handleset (with a lock). The other is a dummy handleset and it is for like french doors so it doesn't have a latch or a lock. Thank you!